Bituminous coal is an organic sedimentary rock formed by diagenetic and sub metamorphic compression of peat bog material. It is also called as black coal. It is often referred to as soft coal. However, this designation is a layman’s term and has little to do with the hardness of the rock. Bituminous coal is by far the largest group and is characterized as having lower fixed carbon (C) and higher volatile matter than anthracite coals. It is the type of coal which is most widely used in the world today. Bituminous coal is the second highest quality of coal (below anthracite) and the most abundant type. Usually, bituminous coal comes from fairly old coal deposits (around 300 million years old).The energy density of this coal is relatively high, therefore, releases a significant amount of energy when burned. Bituminous coal is defined as a medium?rank coal with either a gross calorific value (CV) on a moist, ash?free basis of not less than 24 mega joules per kilogram (MJ/kg) and with a Vitrinite mean Random Reflectance less than 2.0 %, or with a gross CV on a moist, ash?free basis of less than 24 MJ/kg provided that the Vitrinite mean random reflectance is equal to, or greater than 0.6 %. Bituminous coals are agglomerating and have a higher volatile matter (VM) and lower C content than anthracite coal. This coal is originated by coalification of plant matter deposited in sequences dominated by clastic sediments under diagenetic conditions (thermal and pressure mode) of a given coal basin. Coalification proceeded under geologic time scale. In various coal basins (coal seams) coal matter differs in regard of different primary composition of plant matter and sedimentary environment. Composition of coal (e.g. elemental composition, VM etc.) and mean reflectance of vitrinite reflect final stage of coal metamorphism of a given sedimentary basin. Bituminous coal has a rank higher than that of the lignite coal and sub-bituminous coal, but a rank lower than that of the anthracite coal. The key distinguishing characteristics of bituminous coal are its relative VM and sulphur (S) content as well as its slagging and agglomerating characteristics. Bituminous coal is been named so because of the presence of a tar-like and gluey type substance which is known as bitumen or asphalt. Bituminous coals are composed of three major Maceral groups, which, in the common terminology are known as vitrinite, liptinite (formerly called exinite), and inertinite (Fig 1). Maceral are any of the numerous microscopically recognizable, individual organic constituents of coal with characteristic physical and chemical properties. Macerals are analogous to minerals in inorganic rocks, but they lack a definite crystalline structure. Macerals are coalified plant remains preserved in coal and other rocks. Inertinite refers to components inert in carbonization. Inert does not imply that the materials undergo no chemical reaction, but only that they do not soften or swell on heating and contribute little to the VM. Liptinite is the finely-ground and macerated remains found in coal deposits. Liptinites were originally formed by spores, pollen, dinoflagellate cysts, leaf cuticles, and plant resins and waxes. Vitrinite is quantitatively the most important maceral, accounting for probably 60 % to 80 % of most worked coals, and it is the material primarily responsible for the characteristic coking behaviour of higher rank bituminous coals. Coals relatively rich in the other components are known, but, even in minor amount, they can make significant contributions to the properties of the whole coal. Bituminous coal can be simply classified by applications into two categories namely (i) thermal coal used to provide heat energy in combustion, and (ii) metallurgical coal (also called coking coal) which is converted to coke, in a carbonization process, and used mainly in the ironmaking. Thermal coal is also sometimes called as non-coking coal, steam coal, or boiler coal. The greatest use of thermal coal is in the generation of electricity via the pulverized fuel method. It is used for steam raising purpose and includes all those bituminous coals which are not included under coking coal category. It is characterized by higher volatile matter than anthracite (more than 10 %) and lower C content (less than 90 % fixed C). Its gross CV is greater than 5700 kcal/kg on an ash?free but moist basis. Metallurgical coal is a bituminous coal that allows the production of a coke suitable to support a blast furnace charge. Its gross CV is greater than 5700 kcal/kg on an ash?free but moist basis. It presents unique plastic properties during carbonization which in turn produces a porous solid, high in C referred to as coke. Metallurgical coals, when heated at a moderate rate in the absence of air, undergo complex and continuous changes in chemical composition and physical character. During carbonization, most bituminous coals, except those bordering on the lignite coals and semi-anthracite coals, show evidence of softening, coalescence, swelling, fluidity, and finally hardening of the coal substance. There are marked distinctions in the degree to which each of these plastic characteristics is shown by different metallurgical coal. The quality of the metallurgical coal is determined in terms of chemical elements, ash content, moisture, caking properties, and strength. The most important chemical elements of the metallurgical coal consist of S, phosphorus (P), and alkalis (Na, K). Parameters used to evaluate caking properties can be classified in three major characteristics namely (i) parameters describing quantity and quality of liquid matter during the process of coking, including maximum plastic layer thickness, maximum fluidity, and maximum dilatation, (ii) parameters focusing on coke profiles and geometry, such as FSI (free swelling index), Grey-King index, Crucible swelling index number (CSN), and (iii) parameters regarding the coal caking ability to combine inertinite matter. Metallurgical coals are usually classified as high, medium, and low volatile based on their dry, mineral matter free VM. High volatile coals have VM typically between 31 % and 38 %, medium volatile coals have VM between 22% and 31 %, and low volatile coals have VM between 17 % and 22 %. There is usually a strong inverse relation between vitrinite reflectance and dry ash free VM content. Other terms used to describe metallurgical coals are hard coking and semi-soft coking coals. Coking coal, by definition, must be hard and the term hard coking coal is a general term used to describe coking coals with superior coking properties relative to the semi-soft coking coals. Coking properties are usually rank dependent and the term semi-soft is normally applied to lower rank high VM coals. There is also a third variety of the bituminous coal based on its application. It is the coal being used in coal forges which is sometimes known also as smithing coal. This coal is a type of high-quality bituminous coal ideally suited for use in a coal forge. It is as free from ash, sulphur, and other impurities as possible. Such coals are supposed to contain S not more than 1 %, ash not more than 7 %, C not less than 70 %, and moisture not more than 12 %. Bituminous coal is also classified based on its VM content. Based on this classification bituminous coal is of three types namely (i) low volatile, (ii) medium volatile, and (iii) high volatile. The high volatile bituminous coal is further classified into A, B, and C levels, with a descending CV (ranging from 24 MJ/kg 33 MJ/kg) on a moisture mineral matter free basis. The medium volatile and the low volatile bituminous coals are classified on the basis of the percentage of fixed C present on a dry, ash-free basis (ranging from 69 % to 78 % for medium volatile and from 78 % to 86 % for low volatile bituminous coal). Medium volatile and low volatile bituminous coals typically have CVs near 35 MJ/kg on a dry, ash-free basis. Bituminous coal is a dense, sedimentary rock which is usually black in colour, but can sometimes be a dark brown. It appears shiny and smooth, but generally it is banded, or layered. It has slagging and agglomerating characteristics. 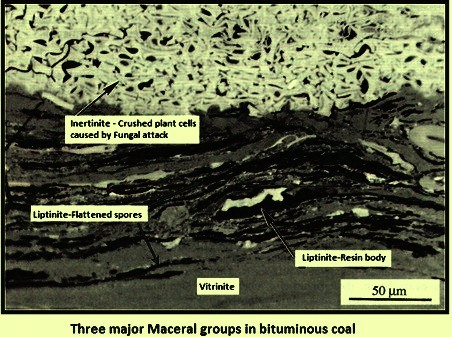 Microscopically, bituminous coal has three main groups of macerals (individual organic constituents of coal).The glassy material in most bituminous coal is vitrinite, composed of macerals derived primarily from woody plant tissue. Bituminous coal usually has closely-spaced fractures. Cleats also form in 2 different sets, both at right angles to each other. The important properties of the bituminous coals are vitrinite reflectance, moisture content, VM content, plasticity and ash content. Generally, the highest value bituminous coals have a specific grade of plasticity, volatility and low ash content, especially with low P, S, and carbonate. Plasticity is vital for coking as it represents its ability to gradually form specific plasticity phases during the process of coking and it is measured by coal dilatation tests. Low P content is vital for these coals, as P is a highly damaging element in the production of steel. Bituminous coal contains moisture upto approximately 17 %. VM in the bituminous coal can range from 15 % to 45 %. Oxygen (O2) content of the coal varies in the range of 3 % to 12 %. Nitrogen (N2) content of the coal varies in the range of 0.5 % to 2 %. Its fixed C content ranges upto approximately 85 %, with ash content varying widely from deposit to deposit. Chlorine (Cl) content is around 340 ppm and S content varies from 0.4 % to 5 % and in some deposits it is even higher. For metallurgical application coal is to have very low S.
Metallurgical coal is best if it has a very narrow range of VM content and plasticity. This is measured by the free swelling index test. VM content and swelling index are used for selecting coals used for the blending of coals used for coking. Bituminous coals have true relative density which refers to the coal mass per unit volume, excluding the pores in the coal in the range of 1.25 g/cc to 1.5 g/cc (grams per cubic centimeters). The scratch hardness (Mohs hardness) is the relative hardness determined by scratching the coal surface with 10 types of standard mineral. The scratch hardness of bituminous coal is usually between 2 and 2.5. CV of the bituminous coal is normally in the range of 5700 kcal/kg to 7900 kcal/kg. Bituminous coal contains the mineral pyrite, which serves as a host for impurities such as arsenic (As) and mercury (Hg). Burning the coal releases trace mineral impurities into the air as pollution. During combustion, around 95 % of bituminous coal’s S content gets oxidized and released as gaseous sulphur oxides (SOx). Burning bituminous coal during its combustion causes pollution which carries with it potential health risks. Hazardous emissions from bituminous coal combustion include particulate matter (PM), SOx, nitrogen oxides (NOx), trace metals such as Hg, As, and lead (Pb), vapour-phase hydrocarbons such as methane, alkanes, alkenes and benzenes, and polychlorinated dibenzo-p-dioxins and polychlorinated dibenzo-furans, commonly known as dioxins and furans. When burned, bituminous coal also releases hazardous gasses such as hydrogen chloride (HCl), hydrogen fluoride (HF) and polycyclic aromatic hydrocarbons (PAHs). Bituminous coal produces excessive amounts of smoke and soot if it is burned improperly and this contributes to high particulate matter. Its high S content contributes to acid rain through the release of SOx. Burning bituminous coal also releases carbon monoxide, and carbon dioxide. Hence it is essential to have pollution control devices in the plants which are based on the combustion of the bituminous coal. Bituminous coal is the most common type coal used in the world for a variety of purposes. Owing to its relatively high heat value, low moisture content and its availability in abundance, bituminous coal has a wide number of commercial uses among all the types of coals. The various uses of bituminous coal include the following. Used to produce steam in coal fired power plant. Used in coal fired plants. For its carbonization into coke for use in the blast furnace, cupola, and foundries. Used for pulverized coal injections in blast furnace and in iron making processes which are based on non-coking coal. Bituminous coal is made free from ash, S, and other impurities, and is used in coal forges, where metals are being worked for their shaping. Used in steam locomotives for running of trains.